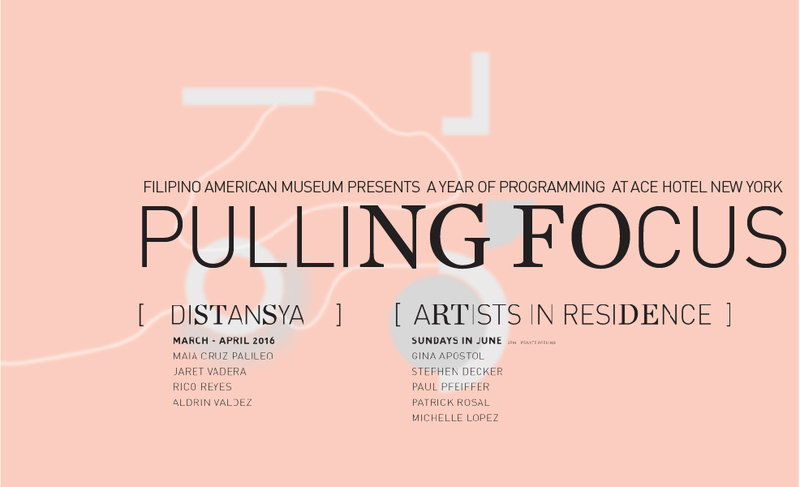 Filipino American Museum begins a year-long programming partnership with Ace Hotel in NYC presenting a roster of events and exhibits featuring artists, writers, and musicians. The collaboration with Ace New York is a first for both parties and will explore ideas of family, home, personal history and the blurriness that occurs in-between. Pulling Focus speaks to a community’s search for clarity, the tentative moments we find it, and the fleetingness of how long it can be held. From a group exhibit to an artist residency to the display windows of the hotel, FAM is excited to enlist friends old and new for a year of investigation, discovery and celebration. Ace Hotel New York Ace Hotel New York lives in a historic, turn-of-the-century building in Midtown Manhattan, invested with the spirit of its surroundings, the culture of the city and the ancient bones of the building. Ace New York has become a central hub for New Yorkers and international travelers alike, and a hotbed of startups, freelancers and people who just want to kick it. However bustling the lobby gets, the hotel is a respite from New York’s mayhem — full of local art, thoughtful details and the best beds in the universe.